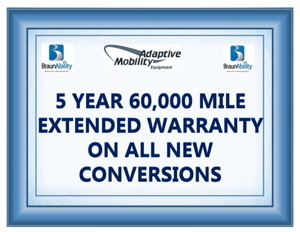 Adaptive Mobility now offers a 5 year 60,000 mile warranty on all new conversions. Contact us for details and restrictions. We also offer extended warranty plans on the conversion of used vans purchased and serviced here. Have a car or van you need to trade? No worry!! We accept all trades and offer easy on site bank financing available. Give us a call or stop by to let us show you the resources available that may help with the financial cost of your purchase. Visit our online showroom for a sample of our current inventory or better yet take the ride to see the vans in our indoor showroom or lighted parking facility. No worry we have ample van parking. Please click here to view our YouTube page!